Very similar in form to the familiar wasteland wildflower Scarlet Pimpernel, this yellow-flowered perennial plant is rather less well known. Yellow Pimpernel has flowers typically 1 to 1.5cm across with sometimes four but most often five pointed petals and long pointed sepals. The heart-shaped opposite leaves are short stalked and broadly ovate. 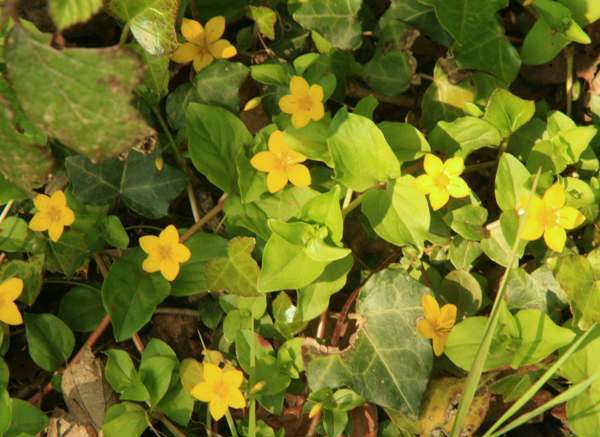 Mainly a creeper, Yellow Pimpernel can grow to 40cm, but 15 to 25cm is more typical. Yellow Pimpernel is native to Britain and Ireland, where it is fairly common except for in very dry areas. This wildflower can also be found across much of northern and central Europe and in a few isolated spots in the Mediterranean region too. 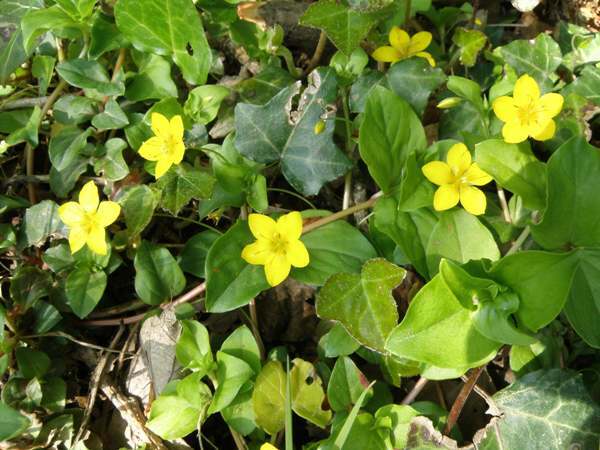 Unlike Scarlet Pimpernel, which thrives in full sunshine, Yellow Pimpernel is mainly a plant of shady places, and it doesparticularly well in damp deciduous woodlands and on the verges of tree-lined country lanes. 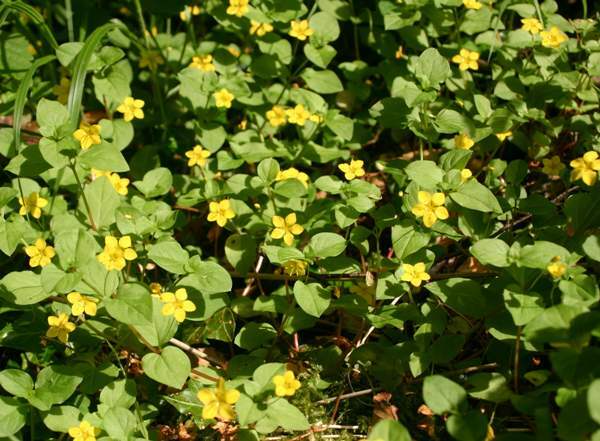 The first flowers of Yellow Pimpernel appear in May, but it is usually late June before this plant is in full bloom. You might still find yellow pimpernel in flower as late as the end of August. Yellow Pimpernel flowers usually have five petals; this one is unusual in having only four. King Lysimachus is reputed to have fed 'loosestrife' plants from this genus to his oxen in order to calm them down whenever they became agitated and difficult to manage. The name Loosestrife means 'lose (or forget about) strife'. (Another common name for this wildflower is Creeping Yellow Loosestrife.) No worries, then! The specific epithet nemorum comes from the Latin nemorus and means 'of the woods'. 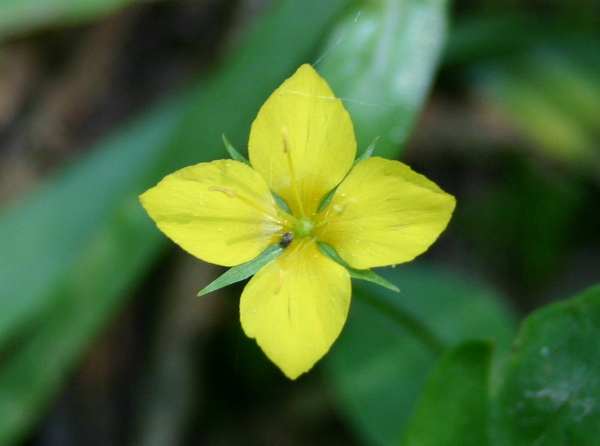 Yellow Pimpernel is often confused with one of its close relatives, Creeping Jenny, but Yellow Pimpernel has much smaller flowers with pointed rather than rounded petals. The Yellow Pimpernel plants shown on this page were photographed in West Wales during June.